It is the intention within this blog to credit scholarship and photographs where ever possible at the foot of individual entries. No breach of copyright is intended, and if items are not acknowledged, or attributed incorrectly, then I would be grateful if these errors could be pointed out for correction. There are some overarching references that apply almost universally, and to avoid repetition these are cited here. This has for many years been considered as the Bible for the study of Welsh Wells. It provides sections on the history of the development of wells and their assocaition with the Welsh saints and the various beliefs associated with wells. It also provides a list, by county of many of the wells known in Wales. It’s serious limitation is that it was put together as a desk top study through a review of numerous written sources. No field work was done, he never sought to get his wellies dirty and as a result no distinction is drawn between wells still extant and those that have long since vanished. The list is by no means exhaustive, it is often claimed that it is much less complete for North Wales than it is for South Wales. Massive four volume epic that tells you all you could ever wish to know (and more) about the Celtic and British pantheon of saints. Biographies are in general drawn from the early medieval accounts of the lives of the Saints, written generally some 500 years or more after the saints death. They are of course largely fanciful, the authors try to sift out some of the clearly fictional miraculous events associated with the subjects, howver much of this remains to provide a fascinating record of local cults, history and rituals. Reference is often made to saint’s wells where known. Allowance must be made for the date of publication, since when research methods and materials have changed significantly. Eirlys and Ken Lloyd Gruffydd (1999) Ffynhonnau Cymru, Carreg Gwalch, Llanrwst. Written in Welsh; in many ways, this invaluable book does the work for me. It is Volume 2 that I have which covers the Northern Counties of Flint, Denbigh, Caernarfon and Anglesey. The book is a gazetteer to the wells of those counties, providing a summary of the information readily available about each accompanied by a selection of black and white photographs and line drawings. A number of eminent Georgians and Victorians made tours of Wales, describing the people, the buildings and the customs they found on their journey. A number of these provide descriptions and histories of wells, providing an indication of what the sites looked like 100 or 200 years ago. They also provide general entertaining reading which shows the great changes in the area that have taken place in recent centuries. Lewis, Samuel(1849) A Topographical Dictionary of Wales. Which is rather summed up by its title. Mr Pennant, a Welsh gentleman exiled in England takes a tour of his native land and reports back, in three volumes, at great length, on what he finds there. 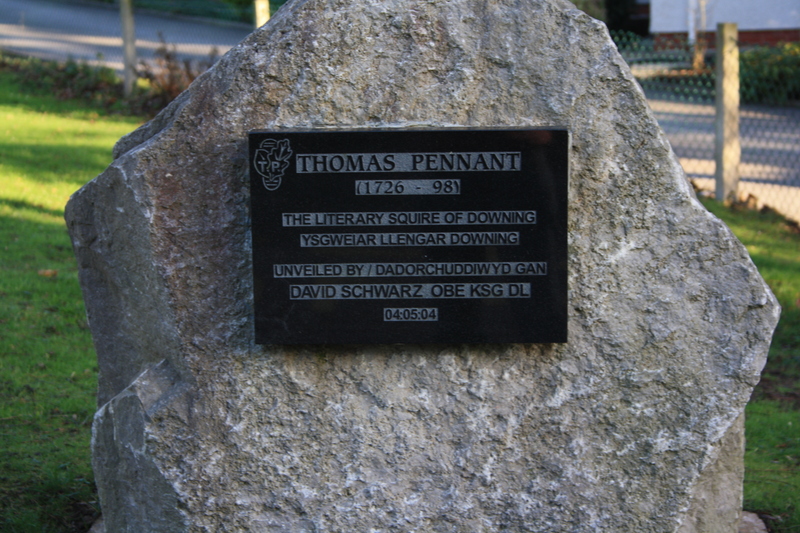 The Pennant family had a large estate at Whitford, Flintshire, and Thomas is commemorated on a stone recently erected outside the school there. A wide ranging discussion of the cult of water, covering wells, rivers and lakes, exploring the folklore and traditions across Britain. Discusses the origins of customs surrounding wells, exploring the Christian and pre Christian cultures that provided the origins of well use. Appended is a gazetteer of 200 wells across Britain and Ireland. A spotters guide to all the most complete remaining wells remaining across Britain. Split by county the main wells are described and details given on how to find them. Illustrated throughout with black and white photographes. The majority of the wells described are in England, although a number of Welsh wells are included. An A-Z Guide of well customs and rituals. The book is organised alphabetically detailing all the important themes surrounding holy wells across the UK, dealing with beliefs, traditions associated with the wells and the importance of wells in people’s lives across the ages. Examples are quoted for each category and an extensive bibliography is provided. Two excellent wide ranging books, heavy with fantastic photographs of wells and springs across Wales and the English borderlands, with an informative text and discussion on well usage across the ages. Hulse, Tristan Gray (2002) The documentation of Ffynnon Ddeier: some problems reconsidered. Living Spring Journal 2. Jones, Graham (2007) Saints in the Landscape. Tempus Press, Stroud. Williams G J (1882) Hanes Plwyf Ffestiniog.